Snokelling nirvana: looking across Cabbage Tree Bay to Shelly Beach. 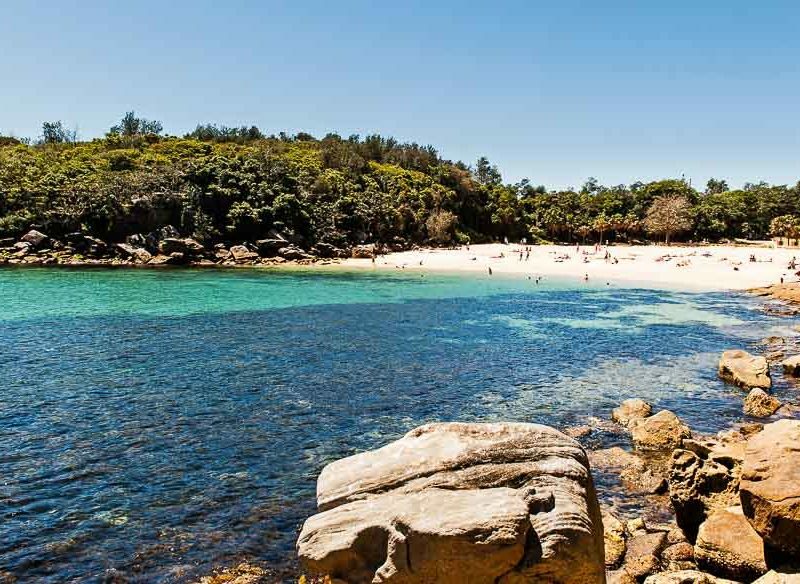 Ever wondered where the best snorkelling spots are in Sydney? Being a fully protected aquatic reserve has its benefits and Shelly Beach, tucked away on Manly’s southern end, certainly has reaped the rewards after a decade of sanctuary. 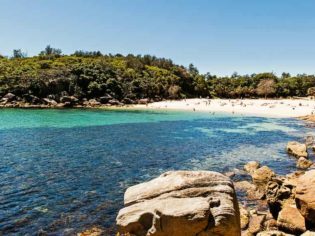 Sydney’s most popular snorkelling spot is arguably its best too, partly because it’s sheltered from the ocean swell on most days, too. Shelly’s strength is its diversity with everything from large schools of mullet and trevally to small harmless sharks such as dusky whalers and wobbegongs. You might even see a hawksbill turtle if you’re lucky. For all its upsides, Shelly can be busy with a capital b on a sunny weekend. Most days you will be able to see a bit of sea life in Clovelly Pool, but that’s not where the action is. On a calm day (make sure there’s no discernible swell), just over the pool’s edge, on the ocean side, is where you want to be. The underwater topography is quite dramatic under the lip; big boulders harbour giant cuttlefish and sponges. If you’re up for a bit of a journey (strong swimmers only and only attempt when glassily flat), you can explore more of the Bronte-Coogee Aquatic Reserve by snorkelling around the point to Gordons Bay, where you might come face to face with the famous 1.2-metre blue grouper. Clovelly is a reassuring place for novices and you can get in and out via concrete steps. Being so close to shore, the long, shallow, protected reef on the North Harbour side of Manly makes Fairlight a great introduction to snorkelling for the kids. You can swim out a fair distance and still be in three or four feet of water before the shelf ultimately drops off. Look out for kelp fish, sea slugs and John Dory. Snorkelling is at its best in the morning and afternoon with a favourable northerly wind (not a southerly). Striped Catfish, Cabbage Tree Bay (Photo: Peter McGee / Goodviz photography). It’s about a 15-minute walk from Manly Wharf to Sydney’s oldest aquatic reserve. To get away from the crowds, head to The Basin Campground, on the eastern shores of Ku-ring-gai Chase National Park (on Pittwater). Upstream, the estuary is protected by a shark net so you can watch the tides go in and out along the seagrass beds with few worries. Loring’s nudibranch, Bare Island (photo: John Turnbull). There are plenty of smaller tropical species around (in the warmer months) but also keep your eyes peeled for seahorses, small cuttlefish and schools of rays. You can bushwalk in from West Head and camp at the Basin or get the ferry across from Palm Beach. Port Jackson sharks frequent the islands around Bare Island (photo: John Turnbull). You might recognise Bare Island if you’ve seen Mission Impossible 2 (motorbike onto the island scene), but snorkelling here is a lot more of a calming experience. In tranquil conditions nooks around the island’s less-exposed coves are ideal for both beginners and the more experienced. On any one day you might come across sea slugs, sponge gardens and pineapple fish. Keep an eye out for one of the resident turtles too. Located at the south end of Anzac Parade, just off the coast of La Perouse. The Big Bellied Seahorse (photo: Peter McGee / Goodviz photography). On Botany Bay’s southern entrance, Kurnell is perhaps the most underrated location in Sydney, harbouring the largest congregation of weedy sea dragons in Australia (a fish related to the seahorse). Captain Cook’s first stomping ground is one of the most diverse underwater communities on Sydney’s coast, home to moray eels, Port Jackson sharks and loads more. Occasionally, you may be surprised by an Antarctic fur seal or two too. Try Silver Beach, for an easy entry point. Swim east towards Kamay Botany Bay National Park, passing Cook’s obelisk. There is some really nice snorkelling off Freshwater but the caveat is that you really have to check sea conditions (make sure that waves aren’t breaking heavily on the rocks and look out for a southerly). When it’s calm, park up in the car park, stroll down to the beach and walk around the swimming pool and enter at the inflow (keep the rocks to your left). There are loads of schooling fish such as king fish to keep you focussed. Fiona McCuaig from the Australian Marine Conservation Society, currently campaigning for a multi-use Marine Park for Sydney which “will enhance marine biodiversity conservation and ensure fish for the future”. Richard Nicholls from Dive Centre Manly. John Turnbull from Marine Explorer. Thankyou for this, some great future smorkel projects.